The restaurant industry has witnessed a huge boom in the past few decades. With an increasing shift in the lifestyles of people, more and more people prefer eating out- be it with their families or on formal gatherings. Hence, restaurants are places which are always chock-a-block with people. With such great demand for good food, restaurateurs are always striving to provide the best service to people and manage each and every aspect, right from taking orders to delivering the food, with great efficiency. Challenging tasks like managing order entries, maintaining recipe costs, inventory documenting and a lot more has to be looked into. 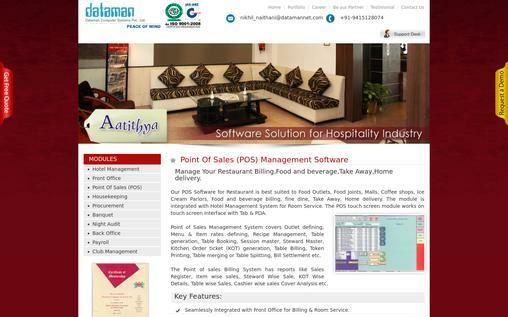 It is here that the restaurant management software prove immensely beneficial. These softwares make the entire management of your restaurant business much easier. Every aspect of your business is looked into and managed with ease. Here is a guide to the 10 best restaurant management software which will surely help you in choosing the right software for your restaurant business. 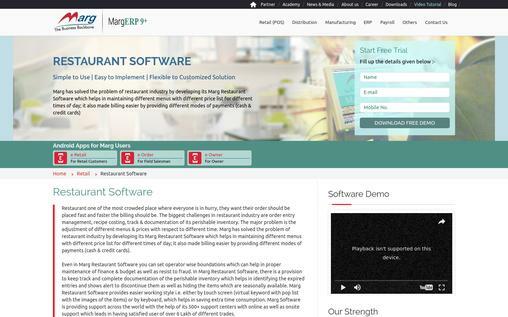 Marg is one such restaurant software which simplifies the entire process of restaurant management. Different menus for different hours of the day can be decided upon using this software. The software is very easy to use and offers a number of great features which ensure the smooth and effective functioning of your business. The software facilitates easy and quick billing by incorporating different modes of payment like credit cards and cash. Use Marg to have varied menus with different price lists at different hours of the day. Prevent fraud and maintain a proper record of finance and budget by setting limits for each operator. Document perishable inventories make a note of all expired entries and even hide all items which are available seasonally. The user-friendly interface enables you to work either by using a touchscreen or the keyboard. The software provides online and onsite support with more than 500 support centres. Provide discounts on different items and bills. Also, provide various discount schemes. The document printing feature enables you to easily print all documents like vouchers, challans, credit or debit notes and much more. Use the fully customisable invoice format to create different invoices like vat invoicing tax, MRP billing, trading excise invoice and much more. Create different taxation reports, registers and MIS reports using Marg. 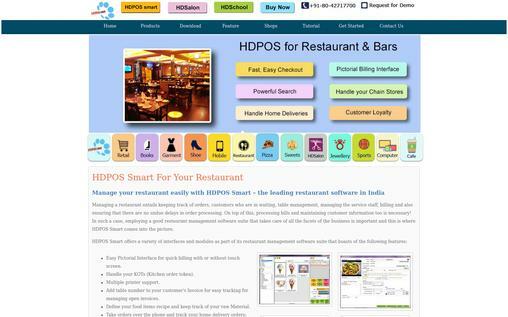 HDPOS Smart is one of the most loved restaurant management software available today. This software enables you to look into every aspect of restaurant management like the management of tables, taking orders, billing, staff management, delivery and much more. 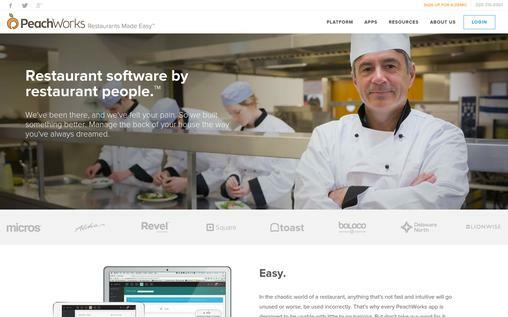 Witness a boost in your restaurant business using this great software. The pictorial user interface with a touch screen is very easy to use and saves time as well. Easily manage all orders using the Kitchen Orders Token feature. Make use of the table booking feature to reserve tables, mark tables ‘in use’, put table numbers and mark vacant tables. Manage all advance bookings using the advance booking feature. Maintain an estimation of all raw materials and define recipes using the recipe management feature. Manage all home delivery orders seamlessly and take orders over the phone using HDPOS Smart. Win more customers by marking Happy Hours. Create customised sales invoices and print them in the paper size of your choice. The software helps you keep a record of customers and view orders placed. This helps in target marketing. Payments with food coupons enable advance table booking. 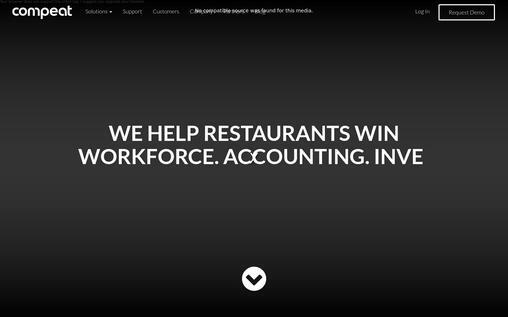 Your restaurant business is sure to thrive and prosper with Compeat. This one software manages all facets of your restaurant with ease. This software has a number of excellent features which looks into different aspects like labour management, accounting, inventory, hiring, costing of menus and much more. Hiring has become a lot easier with the Applicant Tracking System and complete Onboarding. The effective labour management tools enable you to calculate labour costs, create payrolls, run reports, keep track of attendance and also maintain information of all employees. Make use of Schedule to create schedules much faster, interchange shifts and maintain better communication with employees. Use the Payroll feature to create payrolls, print cheques, report wages and distribution of labour and so much more. The excellent accounting tools enable you to get sales reports on a daily basis and ensure that the general ledger is always up to date and in balance. Manage inventory, compare theoretical and actual inventory usage, maintain recipe costing, bring about changes in the menu and do a lot more using Compeat. Use the digital logbook to manage shifts with ease. The custom dashboard showcases all the details of your business and helps you keep track of every aspect from one place. 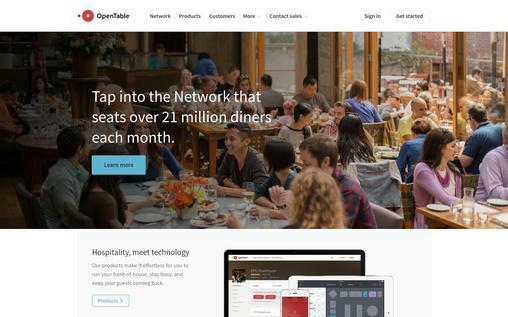 Open table is a trusted restaurant software which boasts of having a network which provides services to more than 21 million diners every month. You can seamlessly run your restaurant business and also ensure to retain more and more satisfied customers using this software. This software provides one of the best networks which functions exceptionally well providing two reservations per second. Manage all booking reservations and keep a record of all waitlisted and walk-in guests using Open Table. The software enables you to better your communication with the guests and enhance retention rates by providing them optimal satisfaction. Make use of the tailor-made tools of the software to manage your front of the house with ease. The after house reservations feature allows you to retain all reservations. Maximise the seating arrangements to get optimal returns. Optimise marketing at different times of the week using the great tools of Open Table. Open Table provides online, phone as well as in-person support. Process payments easily and send digital invoices by accepting Apple Pay. Design customised gift cards for your restaurant which your guests can send as well as receive. Private dining listings help generate more event leads, thus giving a boost to your business. Managing your restaurant business will be a lot easier with Peach Works. The software is based on cloud solutions with which you can manage every aspect of your restaurant business from any place using your laptop, mobile or tablet. Manage all aspects like managing recipes and inventories, scheduling, reporting and more using Peach Works. The software enables efficient recipe management, calculation of inventory usage and nutrition facts and much more. Efficient labour management allows you to smoothly handle employee schedules in compliance with the laws and policies of the company. Make logs and checklists suiting your needs for every aspect of your business and also receive timely alerts. Use the team app to communicate with your team, provide information and receive feedback. Use the advanced reporting feature to generate reports and analyse all data. POS integration enables you to gather all information from a single or different POS system and check sales reports or input the data into the other apps of the software. The apps of the software are fully customisable and you can even create your own app. The software’s scheduling feature is cloud-based with which you can easily create schedules, arrange shifts and do much more. Athitya is a restaurant software which is suited for all types of food outlets like coffee shops, ice cream parlours, home delivery, take away and much more. This POS software has a touch screen interface which looks into a wide range of aspects like table and recipe management, bookings, menu, kitchen order tickets, billing and a lot more. The software enables efficient handling of billing and room service with its integration with Front Office. Athitya generates Kitchen Order Tickets for a single as well as multiple outlets. The touchscreen PDA graphic user interface helps you to easily generate bills and orders. Manage home deliveries easily using the order booking system. The software offers efficient KOT management which is free of charge. All payments can be collected and settled cashier wise. View your entire sales and discount summary according to tables, items and stewards. Analyse all your kitchen order tickets and void bills and receive log analysis of kitchen order tickets using this software. Settle and split bills with credit cards and cash, by verification through smart cards or even complimentary. 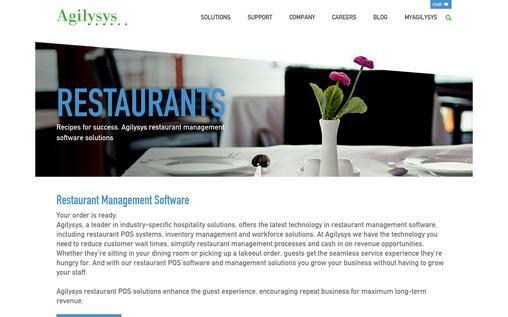 Agilysis is one of the leading restaurant management software which offers the best hospitality solutions to its users. The software uses the latest technology and eases out the entire process of restaurant management for you. With this software in place you can be rest assured to provide great service to all your customers- whether it’s for those who are dining in or for take away and home deliveries. Choose from the different point of sale software of Agilysis like InfoGenesis POS, InfoGenesis Flex, InfoGenesis Mobile and rGuest Buy to suit your needs. The self-service kiosk for guests integrated with InfoGenesis POS enables you to provide better service and also reduce your labour costs. Use rGuest to provide a secure payment gateway to customers and also reduce your costs. The easy to use reservation and table management tools enable you to make bookings, manage wait lists and tables with ease. Use rGuest Analyse to generate reports which help you to prevent losses and analyse staff performance, table service and restaurant traffic at different times of the day. Make use of Eatec and Stratten Warren System, the inventory management and procurement solutions software to keep a record of inventory usage and consequently reduce food and labour costs. 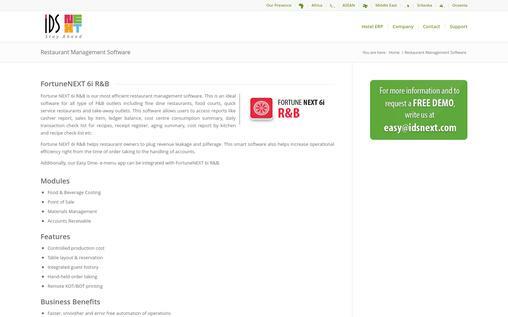 HotSchedules allows you to quickly create, manage and monitor employee schedules. The expandable document management tools automate tasks, enhance productivity and reduce costs. The professional services team of the software allows you to optimise your ROI by providing consultations, training, assistance for disaster recovery and other kinds of technical support. The table layout and reservation tools allow you to easily manage table reservations, the waitlisted guests, walk-ins and much more. Keep a record of all information about your guests by using the integrated guest history. The software automates the printing of KOT’s and BOT’s. Generate advanced reports of sales, cashiers, consumption summaries, ledger balance, kitchen and recipe costing and much more. The inventory management tools enable you to keep a record of inventory levels, automatically generate purchase requisition, view daily consumption and a lot more. Order and billing can be generated through touch POS and tablets. The table layout screen has fully configurable table layout options for the smooth management of all aspects of your business. Billing and room service is made easier with the software’s complete integration with FO. Manage cash flow and generate projection reports to keep a track of all due payments. Send reminders and confirmation of balance through emails or on print. 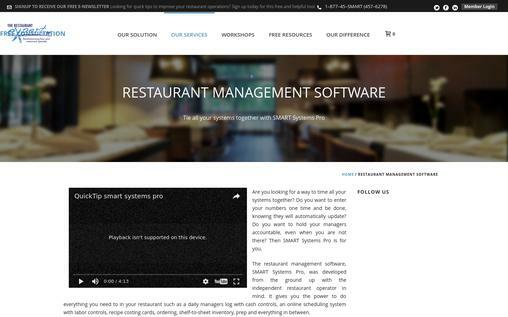 Smart Systems Pro is a restaurant management software which is tailor-made to suit all the needs of your restaurant business. With this software, you can easily automate all repetitive tasks and keep track of all the aspects of your business from any place. Manage tasks like scheduling, labour management, food and recipe costing, inventory management and much more with this amazing software. This cloud-based software allows you to manage all restaurant operations from anywhere with just your mobile device. The advanced food cost management solution helps you create recipe costing cards in no time and simplifies the management of food costs. Use the prime costs accounting feature to maintain a record of all the additional costs of your business besides food and labour costs. The software also offers an excellent restaurant beverage consulting software. Make use of the excellent Employee Handbook Template to manage labour costs efficiently. The Restaurant Sales Forecast feature helps you to get clear sales estimates and also helps you manage your purchases. The Restaurant Workshops help you make your business more profitable. 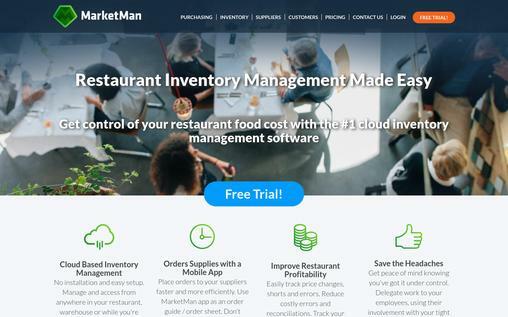 Market Man is completely cloud based and hence you can do everything from managing suppliers, checking status and placing orders from any place. Manage food costs effectively by making plans for menus, and recipes and also making a note of the items most and least in demand. Keep a track of inventory and their value in minutes. The Alerts and Reports feature generates reports, sends inventory alerts and enables you to see the difference between theoretical and actual food costs. Integrate the order handling feature of this software with your ERP to manages orders seamlessly. Create customised product catalogues and also keep them updated. Enhance sales figures through the advanced sales reports and also by converting leads into opportunities for sales. Use the Market Man mobile app to handle orders and keep track of inventory. The demand for good restaurant management software has been consistently rising in today’s times. Most restaurant business owners want to have an excellent restaurant management software in place so that all aspects of their food business are handled perfectly and with ease. All of these ten restaurant management software is amongst the best available today and function extremely well. So what are you waiting for? Go ahead and choose just the right one for your restaurant business. Do you know that email marketing is getting very popular when it’s about to promote the business on the web? Get started to promote your business with MailGet Bolt – An effective & affordable email marketing software service.